SeeRemoving Power From the System . Remove the server from the rack. Place the server on a hard, flat surface. See Remove the Server From the Rack. (SPARC Enterprise T5120) Remove the inner glides from the server. Each inner glide is secured with a locking tab. Release the tab and slide each inner glide off the server mounting studs. If you are servicing the hard drive backplane, remove all hard drives. See Remove a Hard Drive. Note - Make a note of the drive locations before removing them. You will need to install the hard drives in the same locations when reassembling the system. 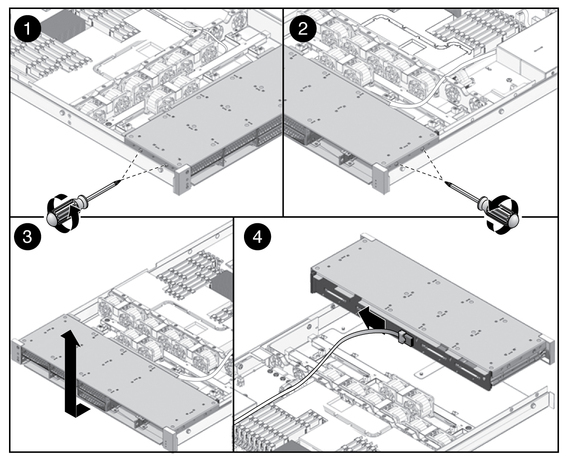 If you are servicing the hard drive backplane, remove the DVD/USB module. See Remove the DVD/USB Module. Fans in locations /SYS/FANBD0/FM0 through /SYS/FANBD0/FM3. Hard drive data cables from the hard drive cage. (Sun SPARC Enterprise T5220 server) Remove the fan modules. (Sun SPARC Enterprise T5220 server) Remove the fan power boards. See Remove the Fan Power Board. Remove the No. 2 Phillips screws securing the hard drive cage to the chassis. Two screws secure the disk cage to each side of the chassis. See panels 1 and 2 in the following figure. Slide the hard drive cage forward to disengage the backplane from the paddle cards. See panel 3 in the following figure. Disconnect the hard drive data cables. Remove the plug from the connector on the hard drive backplane. See panel 4 in the preceding figure. Caution - The hard drive data cables are delicate. Ensure that they are safely out of the way when servicing the motherboard. Lift the hard drive cage up and out of the chassis. Set the hard drive cage on an antistatic mat.